I love my Cell Bikes Mallet II custom fixie. I spec’ed it with a yellow frame and all other options black. I removed all decals and logos. The bike looks great and I get lots of comments on it. I have nicknamed it Bumblebee. I ride for training and fitness. I bought the fixie as an alternative to my Fuji Absolute 3.0 flat bar alloy road bike. The fixie is a different riding style to a geared bike. Carrying a lot more momentum and needing to plan hills has improved my overall riding greatly. Delivery from Cell Bikes was super quick. The bike came partially assembled, with only needing to put the front wheel, handlebars and pedals on the bike. On close inspection, the frame paint and welds are average in some places, but that’s just being picky — for the price, it is fine. I am also not a big fan of the rack mount points. Again, a niggling complaint, but to me fixies are about being stripped down to the basic bike essentials. I am not a fan of Wellgo pedals, so I put on a set of Shimano PD-R540 pedals straight out of the box. Even though the fixie runs riser bars, it is still a much more heads-down riding position than my flat bar road bike. It took me a couple of rides to get comfortable in the riding position. In my opinion, the frame geometry is perfect for this style of bike. The bike is responsive enough to be fun, but not on-the-edge like track-bike geometry. I removed the freewheel and only run the bike with the fixed gear. I played around with the gear sizes, but in the end found the original 46/16 setup perfect. My regular 30 km Brisbane River ride includes Highgate Hill, which I can get up (and even overtake some riders) in this gear. Riding down the hill, I sometimes need to use a little braking to keep my cadence at an acceptable level. Most other hills are easy to get up and roll down with a little planning. The fixie is surprisingly quick. 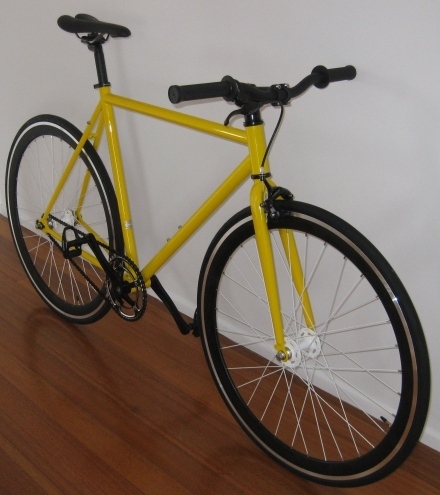 I am just as quick on the fixie around 30 km as on my 24-speed alloy flat bar roadie fitted with Easton wheels. Speed carried at different points in the ride is significantly different. In particular, faster up hills, and slower down hills. The fixie gives a much better workout because I have to pedal ALL the way around the circuit. I just love passing the lycra-clad, drop-bar road bike set on my fixie! This entry was posted in Bicycles and tagged Bicycle, Bike, Cell, Cell Bikes, Cycling, Review on 10 April 2011 by Rex.